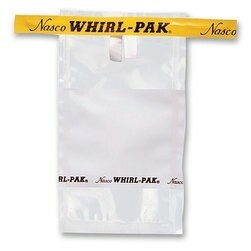 Nasco Whirl-Pak® Bags, clear, 2 oz, 3" x 5"
Nasco Whirl-Pak® Bag, Write-On, 4 oz, 3" x 7.25"
Nasco Whirl-Pak® Bag, Write-On, 2 oz, 3" x 5"
Transparent polyethylene bags for sampling and product analysis. Bags seal tightly, hold solids or liquids. Combination of tape and double-wire framing on top of both sides make them stay open. To get a moisture and air tight seal, whirl bag over wire tape three times, bend tabs over to lock shut. Feature “puncture proof” tabs for protection due to wire-end protrusion. Pull tabs help prevent contamination for finger contact when opening. Write-on bags have area that accepts ballpoint pen or pencil. Whirl-Pak® sterile laboratory sampling bags are ideal for surface, forensics, genetics, biomedical, and pharmaceutical research sampling and well suited for the food, dairy, water, sewage, medical, veterinary, environmental, soil, and industrial markets. Whirl-Pak® bags have been the professionals’ trusted sampling bag for over 50 years and offer puncture-proof tabs, guaranteed sterility, easy identification, and a leak-proof closure you can trust. Sterile - non-returnable if sterile seal on box is broken. This is a special order item.